Ioannis S. Pateras. Member of Molecular Carcinogenesis Group, Laboratory of Histology and Embryology (LHE), Medical School, National and Kapodistrian University of Athens (NKUA). Bsc(Hons) in Nutrition and Dietetics in Harokopio University, MD in NKUA, PhD in LHE in NKUA under the supervision of Professor Vassilis Gorgoulis. He is AN author in several journals with high impact factor including Cancer Cell, Nat Cell Biol, Pharmacol &Therap, Cell Reports, Cancer Res, Oncogene, J Pathol, Int J Cancer. 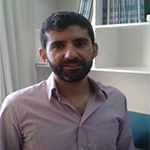 He has participated as research associate in national and international research programmes and is teaching in undergraduate and postgraduate students. Linking chronic inflammation with cancer is an old story going back to 19th century, when Virchow firstly proposed that cancer arises at sites of persistent inflammation. In the revised “Hallmarks of cancer” tumor-promoting inflammation and immune evasion have been included as enabling and emerging hallmarks respectively. There is a growing body of evidence supporting that chronic inflammation in various settings not only promotes carcinogenesis but it also supports tumor development fueling several hallmarks. Within this frame we are going to present how aberrant activation of key signaling pathways in various settings including the DNA damage response machinery trigger inflammation.